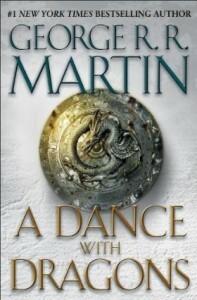 A couple of days ago George R. R. Martin announced the first few stops for the book tour for A Dance with Dragons, the fifth book in the Song of Ice and Fire series (available on July 12). The first few appearances will be in Boston, New York City, and Indianapolis, and Martin will also be appearing at San Diego Comicon. Those planning to attend this year’s Readercon (July 14 – 17) may be interested in the fact that the first event will be at a Barnes and Noble also in Burlington, Massachusetts, on July 12. So if you have time to leave a little earlier you could go to both the first tour event and Readercon, which would be pretty fantastic. I was considering going to Readercon this year myself so I’m half tempted, but I highly doubt I will since if I go I’ll be trying to avoid having to take more than one day off from work.